Mumbai: Researchers from The University of Otago are playing a key role in revealing previously unknown information about prehistoric settlement in the South Pacific. Professor Hallie Buckley and Dr Rebecca Kinaston of Otago’s Department of Anatomy, co-authored new research, published recently in Nature Ecology and Evolution. Their role included excavating skeletons to investigate health, disease and diet in the early colonisers of Remote Oceania peoples. “We excavated 38 skeletons ranging from the Lapita period to the proto Historic period just prior to European arrival in the 19th century. With the remains we used osteological and chemical techniques to discover evidence of diet and health in these people,” Professor Buckley says. The ancient DNA research was led by an international, multi-disciplinary team at the Max Plank Institute of the Science of Human History (MPI – SHH) based in Germany. Together with researchers from Australia, France, Germany, Vanuatu, and Otago, the team concentrated their efforts on the South Pacific island of Vanuatu. Their findings concluded that Vanuatu is an unprecedented case where a population’s genetic ancestry but not its languages have been replaced. 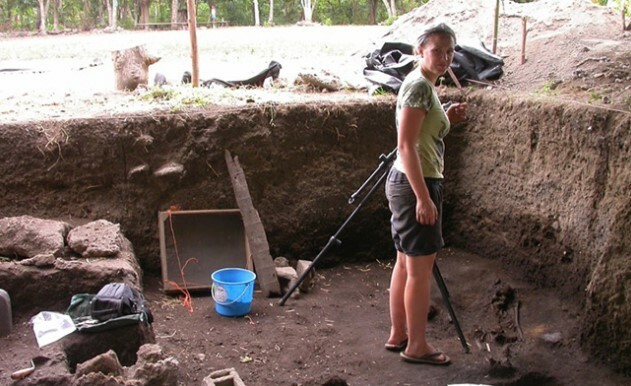 Archaeological and previous genetic analyses have shown that the earliest inhabitants of Vanuatu, arriving about 3,000 years ago, were the Lapita peoples who spoke a form of Austronesian language and who had largely East Asian genetic ancestry. However Vanuatu’s contemporary population has largely Near Oceanian heritage (the islands of Papua and Solomon Islands) showing that, over time, the genetic ancestry of the early inhabitants of Vanuatu was mostly replaced by Papuan populations. Professor Buckley says as Vanuatu is the gateway to the rest of the Pacific, understanding its demographic history is critical to uncovering that of the wider region. “As more is discovered through this type of investigation, we can learn more about the intricacies of prehistoric settlement of the Pacific – where people came from, when, and so on. This could potentially go so far as to provide new knowledge of New Zealand’s prehistoric record ancestral heritage,” she says. Vanuatu is, per capita, the most linguistically diverse place on Earth and over 120 ‘Austronesian’ languages are spoken by the people of Vanuatu today. Professor Buckley says that based on the findings of this latest study, the next logical step would be to try and trace the origin of the Papuan ancestry into Remote Oceania. Fortunately, the University of Otago has a long history of archaeological research in western Pacific islands and samples from these sites will form the next step in the Otago/MPI-SHH collaboration. Next articleHRD Minister Prakash Javadekar launches the Grand Finale of the Smart India Hackathon 2018 (Software Edition).